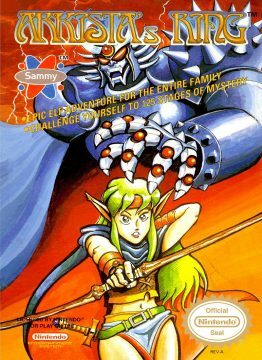 Most people associate top-down shooters with frantic action or some kind of glitz/glam/gore excess thanks to the like of Smash TV or Robotron. 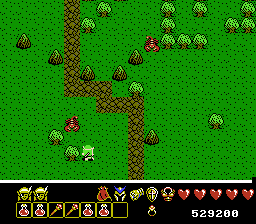 However there do exist a more deliberate variety of top-down shooter and that brings us to Arkista’s Ring. 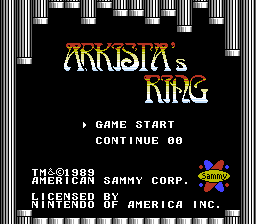 Developed by NMK and produced by American Sammy, Arkista’s Ring is one of those rare few NES games, like its top-down contemporary Startropics, that saw release almost exclusively in North America. The Shogun leader of the Ninja clans has stolen the ring of the Elven nation of Arkista, it being an artifact that brings about the nation’s prosperity. Two other treasures were also stolen, sourcing wealth and protection to the Elven peoples. Without the artifacts they feel they will not survive, enter Christine the only Elf with a spine. 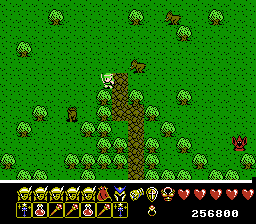 Armed only with the traditional weapon of her people, Christine must contend with disagreeable wildlife, fantasy staple jerks, undead hordes and the greatest evil of all: Ninja. 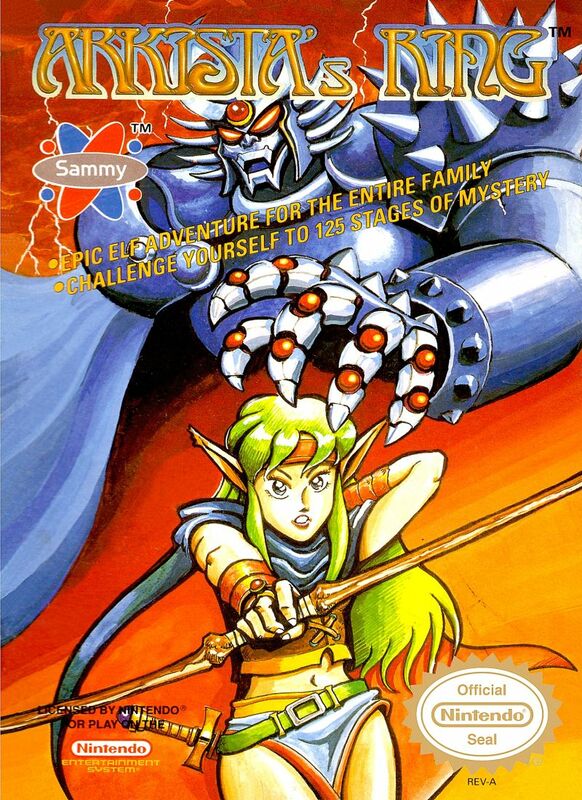 The game box espouses “Epic Elf adventure for the entire family” and “125 level of mystery”. 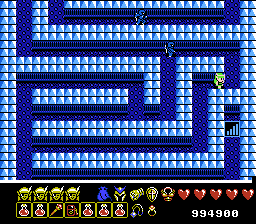 In reality, the game has 31 levels looped four times, with the Shogun at each multiple of 31. What about the 125th level? –THAT- is the mystery, apparently. 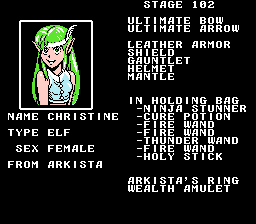 Christine starts only with a short bow, short arrows, a 4-slot bag, 5 hearts and two extra lives. Thankfully for her, most enemy types will drop bags with various benefits inside of them. 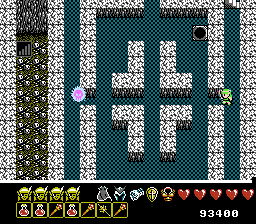 It is through this method that Christine can increase her range by getting better bows, damage with better arrows, health maximum by finding armor, larger bags and things to fill said bags. Rarely she will also gain extra lives as well. The special tools available for her to deploy are the Cure Potion which will fully restore Christine’s health, the Wand of Fire which will replace Christine’s arrows with fast-flying, hard-hitting, wall-piercing fireballs for the remainder of the current level even if Christine should die, the Holy Stick which will instantly kill anything immune to arrows or fire, the Thunder Wand which will damage all enemies on screen and the Ninja Stunner which does exactly what it says. Enemies adhere to given AI patterns, from those who just try to collide with Christine which is quite effective given archery is her core defense, enemies that remain immobile in inconvenient locations that function as cardinal direction turrets to enemies that pace up and downward on the Y-axis firing at any Elf they see and of course the dreaded evil of evils, ninja that relentlessly chase Christine and beat her with swords. 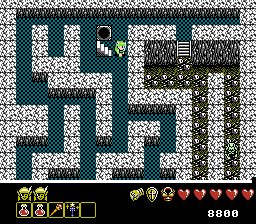 The game plays well enough, Christine moves around on a per-tile basis, but can be moved back the way she came before reaching the next tile, allowing for the player to attempt to peek-and-bait some enemies into moving or firing in certain ways. 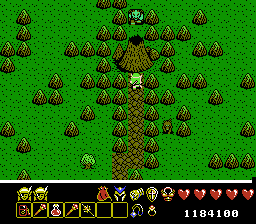 Each level sees the player killing monsters that spawn in specific locations in specific sequence until a key spawns at a specific point on the current map. 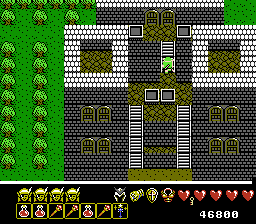 Acquisition of the key allows Christine to unlock gates, trees, mountains, sarcophagi and doors which impede her progress in one manner or another. 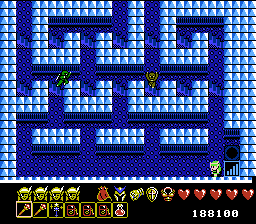 A level is completed by stepping onto a specific tile but it’s generally rather obvious or unavoidable so this isn’t much of an issue. 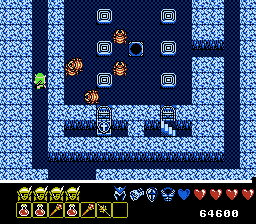 This formula is only interrupted when facing one of the two (three if one counts the second appearance of the first) mini-bosses or the Shogun himself, in which case their destruction is what spawns the key. 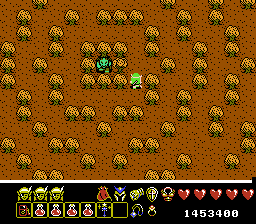 Visually the game is competent with no flat tile textures to be found. 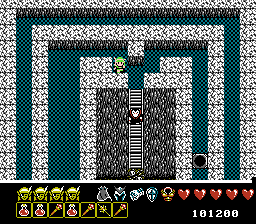 Certain indoor tilesets are even set up so that there is a degree of perspective. 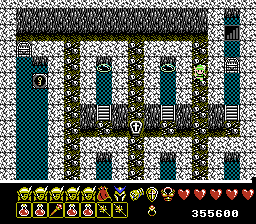 Over the course of the adventure Christine will travel across plains, through forests, stop in a town, pass volcanoes, step into more than one crypt, hang around a dock and storm the ninja castle. 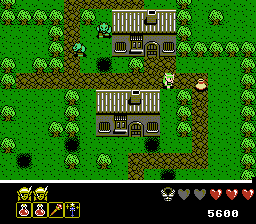 While several of these settings share tile assets, there are varied uses of tile color and pacing so it never really gets tiresome looking at anything. Audio-wise, there are only a few tracks in the game and while they are well made, they aren’t particularly memorable or interesting. It’s further difficult to enjoy them as they make use of the same sound effects channel that Christine’s bow does, which results in aural disruptions every time you attack, which is very often. 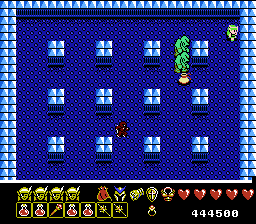 Speaking of sound effects, there is no message system in the game and as such any time Christine picks up a bag, it’s contents are reported with a specific sound effect, necessitating the player familiarize themselves with the sound effects in the event that there’s not enough visual information (I.E. an icon appears or changes) to convey just what exactly happened. 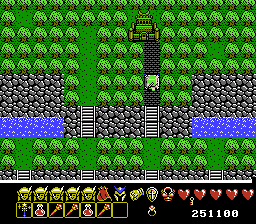 Thankfully there is a status screen that can be viewed… but only between levels and the player must press Select while the stage number is displayed to access it. This will report the current state of all things Christine, including her species, gender, hometown and name. This also includes her portrait. The status screen hints at grander aspirations for the game, and a check inside the game’s code practically confirms it. 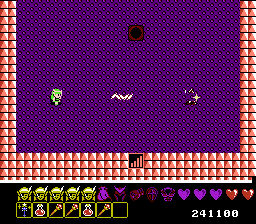 Unused assets range from many more enemy types unseen as well as sprites for what appear to be NPCs that the player potentially could have spoken to. In the released state, there is no one to talk to at any point and the only ‘dialogue’ is the let-down ‘you win’ message you get for completing level 124. 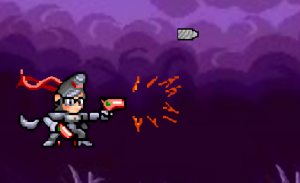 What the devs had in mind for the game can only be guessed, but the final product is pretty clearly not exactly it. 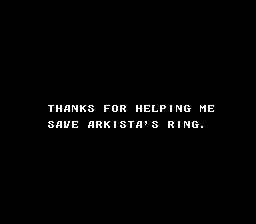 The big issue with Arkista’s Ring is that it’s monumentally repetitive, as you have to play the game four times to win, and while the individual areas look and largely play nice, four times is a bit much when the only difference is the enemies. 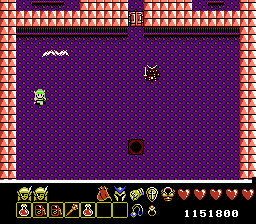 Even the mini-boss enemies, the Manticore and ‘Grand Master Fang’, still mosey and fire along the Y-axis in the same chokepoints that force Christine to play peek-and-fire or use a Fire Wand cheese them through the wall aren’t any different or more menacing, they’re just a bit quicker. The Shogun is probably the easiest monster by the fourth loop as he doesn’t seem to change at all across all of the loops. 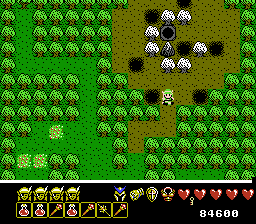 You’ll probably be at maximum power at the end of loop 1 and while you get Arkista’s Ring and the other Elven treasures will be added to the drop tables, the game is largely unchanged and remains vaguely fair only by virtue of how powerful two of the three treasures are. 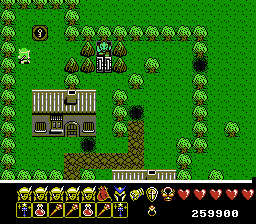 Still, the game has aged fairly well. The repetition is the biggest blow to it and it won’t ever achieve what the devs originally wanted it to be, but the game is fun enough to burn a couple hours on and doesn’t have any real deal-breakers so if you have an afternoon free, you could do a lot worse than giving Arkista’s Ring a run.